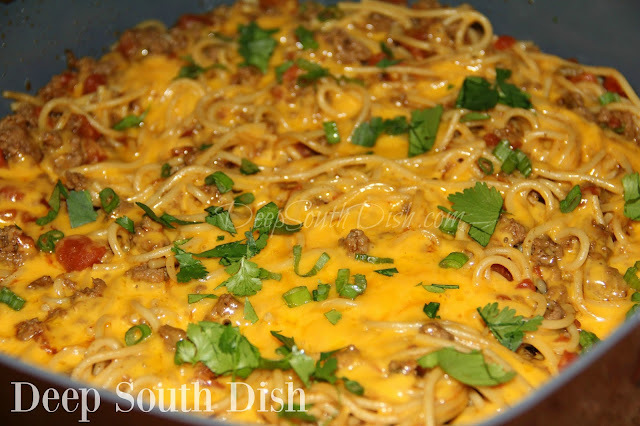 A one pot spaghetti dish made with ground beef, tomatoes with green chilies, taco seasoning and shredded cheese. Although most of the time when I make spaghetti, I use my favorite semi-homemade recipe. It's easy, it's reliable, it's tasty, and The Cajun absolutely loves it. That's really what counts the most, isn't it? Still, spaghetti is so easy to make and delicious that I also like to mix it up a bit from time to time. In the summertime when the backyard tomatoes are in abundance, you just cannot beat a homemade, fresh tomato sauce and my big batch recipe is enough for two meals - spaghetti, usually followed by a lasagna or ziti. When the garden is overflowing with fresh vegetables, there's my veggie spaghetti, and my smaller batch fresh tomato pasta sauce is fabulous for those weeknight meals. Other times throughout the year I like changing up the protein base and flavors to mix it up a bit. From shrimp and scampi, to crab, to chicken, to andouille sausage, to a spaghetti made from a beef roast, or from pulled pork, and an olive oil and garlic spaghetti, I love the different spaghetti varieties. 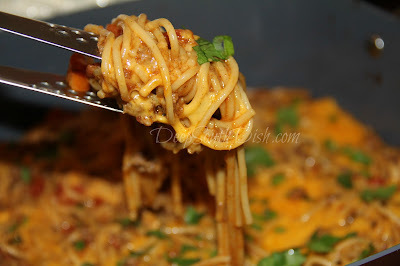 This taco spaghetti, pictured above, is just another version we enjoy. Here's how to make it. As always, full recipe with measurements and instructions is further down the page. 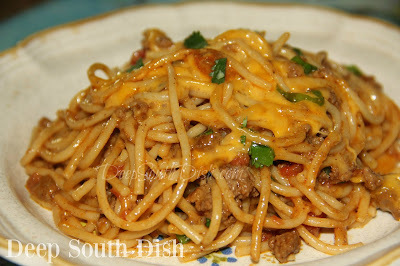 Saute some veggies, add ground beef, tomatoes, seasonings, water and spaghetti noodles. Stir in some cheese, top with more cheese and let melt. Garnish with some green onion and cilantro before serving. Important Note: There's no paywall on Deep South Dish - recipes, step by step photos and printables are available at no cost to our readers, however, advertising featured on the blog helps to pay for the groceries. If you enjoy the blog but you're using an ad blocker, please consider whitelisting Deep South Dish so I can keep the blog going! For more of my favorite spaghetti recipes, check out my collection on Pinterest! Heat oil in a large lidded skillet and saute onion, bell pepper and garlic for 3 minutes. Add ground beef and cook until no longer pink; drain off excess fat. Add diced tomatoes, pepper, taco seasonings, water and spaghetti noodles; stir. Bring to a boil, cover, reduce to simmer and cook until noodles are tender, about 12 minutes. Stir in 1 cup of the cheese, cover and continue cooking another 5 minutes. Remove from heat, top with the remaining cheese and cover just until cheese has melted. Garnish with green onion and cilantro before serving. Cook's Notes: For more heat, use original or hot Rotel. For a milder version, substitute a can of your favorite diced tomatoes, drained. Use Velveeta in place of the Cheddar, if desired. Ground chicken or pork may also be used in place of beef, however taste and adjust seasonings as needed. Homemade Taco Seasoning: Combine 2 teaspoons chili powder, 1/2 teaspoon each paprika, cumin, coriander and Creole or Cajun seasoning, 1 teaspoon kosher salt and 1/2 teaspoon granulated sugar. 7 HUNGRY PEOPLE COMMENTED. ADD YOURS! Mary, I am SO going to try this! As I get older, I'm gravitating to simpler recipes with less prep work and fuss, and this fits the bill! Also, thanks for including the recipe for homemade taco mix - I have a recipe I've used, but I'm going to try yours for a change. Mercy! This looks so good! Your recipes are always the best. I can't wait to try this. Let me know what you think Linda! I did try it! Hubby and I both loved it. Hubby isn't usually a fan of me messing with his favorites much, but he raved over it. I did use original rotel and skipped the cilantro. Fab!